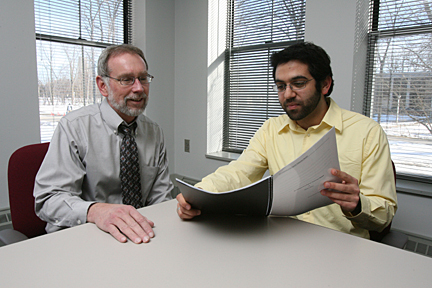 UT junior Hasan Dudar showed his research project to Dr. Larry Connin. Dudar received the first Chaudhary-Steinitz Honors Research Grant for his project that focuses on agricultural development Pakistan. Dudar is a junior in the University Honors Program majoring in political science. In addition, he is the managing editor of The Independent Collegian. The Chaudhary-Steinitz Research Grant was established by Shamila N. Chaudhary and her husband, Christopher J. Steinitz. Chaudhary, a UT Honors Program alumna, majored in English and women’s studies. She works at the U.S. State Department on matters related to Afghanistan and Pakistan. In memory of her time at UT and in support of the Honors Program, she established this endowed grant for UT honors students who are conducting research related to Pakistan (or South Asia and/or the more broadly defined Middle East) within any academic discipline or inter-discipline. The recipient must be a member of the UT Honors Program, have financial need, and be actively engaged in undergraduate research in the designated area. The Chaudhary-Steinitz Research Grant selection committee members included Connin, Denham, Dr. Thomas Kvale, interim director of the Honors Program and director of undergraduate research, and Dr. S. Amjad Hussain, UT trustee and professor emeritus of thoracic and cardiovascular surgery. This entry was posted on Friday, March 12th, 2010 at 5:57 am and is filed under Research, UToday .